To stay updated on all my live gigs and musical ventures, be sure to follow me on REVERBNATION by CLICKING HERE. Thank you so much for the support! For Holiday 2019, be sure to get your copy of Lisa's album, CHRISTMAS IN OUR SOUL. Click on the Album image to purchase. Who's ready for a HOT, HOT Christmas? Enjoy Lisa's new HOT, HOT HOLIDAY song that is sure to become a new Christmas classic! Join my Email List for exclusive and special info and offers! LET IT GO MUSIC VIDEO! Enjoy Lisa's cover "Let It Go" from Disney's FROZEN and her new music video on YOUTUBE. Be sure to SUBSCRIBE to Lisa's YouTube Channel for monthly updates! LISA AS THE LUNCH LADY! Watch It! Enjoy It! Share It! It's got sizzle! --> Be sure to SUBSCRIBE to Lisa's YouTube Channel! 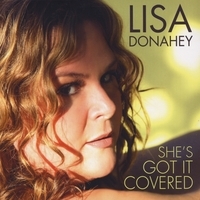 "LISA DONAHEY: SHE'S GOT IT COVERED" INTO ITS THIRD REPRINT! To purchase simply click on the BUY CD link!